Really... I cannot help myself... all I am doing is knitting, knitting, knitting. Don't ask me how my house looks like. Don't ask me about the piles of laundry. Cooking? What is that? All I want to do is knit. 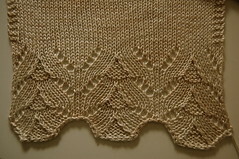 I very much like lace pattern "Open Double Wing" from one of Barbara Walker's pattern books. 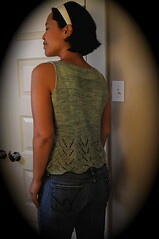 It is a 8 row repeat lace pattern and it is so incredibly easy to follow! So I made a swatch and decided to use it in my Bamboo Summer Shell. The shell pattern? Easy Peasy! Question for you all: What is exactly the difference between a shell/tank/camisole? I really don't know... I just called mine "shell". My shell looks kind of fitted, but really, there is absolutely no shaping applied in this pattern. I Just casted on 170 stitches, did 4 repeats of the Open Double Wing pattern and then changed to stockinette stitch. After 70 rounds, I just shaped the armholes. The neckline I just casted off in a straight line. That's it. No finishing folks. Love easy patterns like that; simple and straight forward. I am very excited about my next project. I am going to work with a lace weight yarn and US #2 or #3 needles. I want to make a light summery little sweater with batwings. My "inspiration" I got from a knitwear designer based here in Portland. Her business is called "Souchi" and she makes very stylish knitwear with an equally "stylish" pricetag. I cannot afford her stuff, but I can certainly try to knit this cute sweater of her's called Batwing myself! I very much LOVE Souchi's designs... If I had a lot of money, I would totally buy her stuff! Loads of money I have not. Just give me a pair of needles and some strand and I'll figure something out. Submitted by Anonymous on Tue, 07/08/2008 - 22:19. I just came across you blog and have to comment on your Summer Shell. It is stunning! What beautiful work you design. Do you publish your works? If not you should! My compliments to you! Submitted by Vanessa216 on Tue, 07/08/2008 - 11:58.
lovely! How i envy all your knitting time and the beautiful garments you produce. Someday I will find a moment to knit again! Submitted by Anonymous on Tue, 07/08/2008 - 00:16. My house is a bit of a mess too, although I haven't gotten much knitting done. 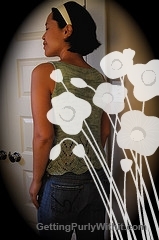 I think a camisole has thin, spaghetti straps (and used to be only an undergarment), a tank has thicker straps, and a shell is a summery top that has a boat neck, v-neck, or crew neck. Tank and shell are usually interchangeable. That's my usage. Submitted by Anonymous on Mon, 07/07/2008 - 11:14. Submitted by MicheleLB on Mon, 07/07/2008 - 04:16. Your shell is beautiful, and it looks like the yarn was perfect for it, too. Congratulations! Nancy, you simply amaze me. Submitted by renna on Mon, 07/07/2008 - 03:20. Nancy, you simply amaze me. You truly were born to design and knit. I can see you having a book (or more) some day.